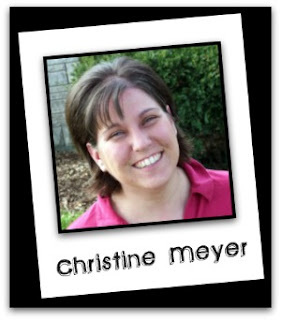 Blog Quick Quotes: Introducing... Christine Meyer! I'm Christine Meyer and I'm a busy mom to three great kids. Our family lives in a tiny town of 100 people in the middle of Illinois farmland. I have been scrapping for about 7 years and love every minute of it. Usually when my kids retire for the night, I head down to my basement studio to work on whatever my current paper project is. I love to make cards of all sorts because I love that I get to really experiment with cards, trying out techniques and fun items on them. But I also love to do layouts because I love to tell the story of our family and the little daily stories we have. Please welcome Christine to the Quick Quotes Team! It is great to be working with you again Christine! Your work is beautiful! Congrats on joining the team- looking forward to seeing what you create! Hi Christine!!!! looking forward to seeing more of your work! Congrats on your QQDT gig, Christine! Hi Christine. I am very much looking forward to working with you on the Quick Quotes Design team! Hi Christine!!! I am looking forward to getting to know you and working with you this year! Congrats on making the team!